Aug. 28, 1939. "Golden Gate International Exposition, San Francisco. 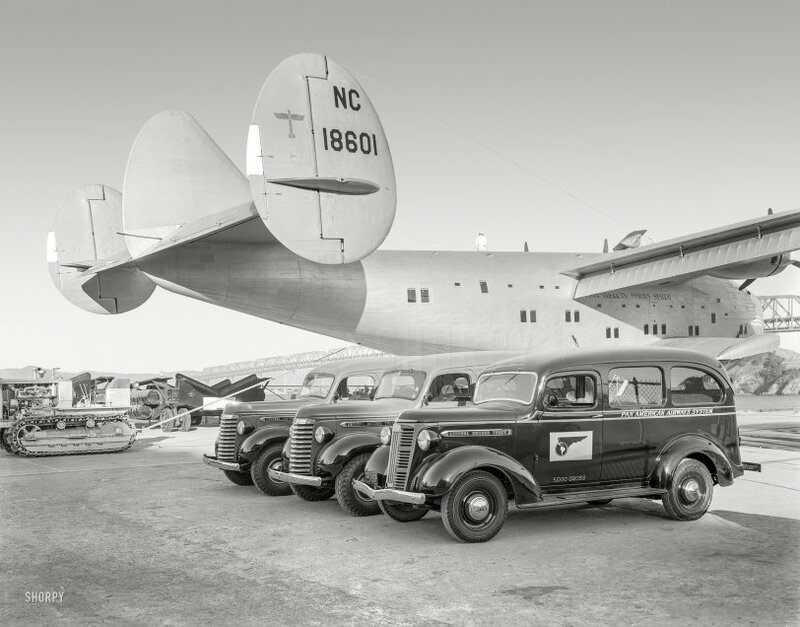 General Motors exhibit of GMC trucks with Pan American Airways Clipper Ship at Treasure Island. Bay Bridge in background." The Boeing 314 flying boat Honolulu Clipper. 8x10 Agfa negative from the Wyland Stanley collection. View full size. Submitted by scottiam on Sun, 02/22/2015 - 4:51pm. NC18601 Pan American's "Honolulu Clipper" started life with a single vertical stabilizer, which was removed for a twin stabilizer tail. During test flights, pilots still complained about inadequate rudder control and the third stabilizer was added. Honolulu Clipper was lost in 1945 enroute between Honolulu and San Francisco after two of her four engines quit. Her crew and passengers were rescued. Unable to make repairs, the aircraft was damaged while attempting to tow her back to Honolulu. The aircraft was sunk by naval gunfire. Submitted by Stolzfus-the-Dut... on Sun, 02/15/2015 - 11:31pm. The nearest truck is a GMC Suburban, long before they became citified, glamorized, sportified, and expensive. They were true utility vehicles -- sport was unheard of then. Submitted by gturkovi on Thu, 02/12/2015 - 12:19pm. Hey! there's a guy walking around on top of that plane!!! I always liked to see the giant C-5 taxi with the flight engineer sitting on top of the aircraft at a hatch while they carefully rolled along; from his perch he was watching wingtips and such to make sure they didn't accidentally "bump into something." I like those roll up window shades!!!!! Submitted by sstucky on Thu, 02/12/2015 - 9:31am. There is a great story about the Pacific Clipper. It was en route from Honolulu to New Zealand when war broke out in the Pacific in December 1941. Rather than return to Hawaii and risk running into Japanese aircraft, the decision was made to fly west to the United States. The plane left Auckland, NZ on 8 December 1941 and flew over 30,000 miles via the Middle East and Africa, enduring bad gasoline, poor landing fields, and many other hazards. It landed safely at LaGuardia Airport on 6 January 1942. Submitted by jimmylee42 on Thu, 02/12/2015 - 9:23am. That man on top of the plane gives a good perspective to the size of this clipper. He also looks like a full service attendant. "You can skip the windows this time, but check the tires please." Submitted by Solo on Wed, 02/11/2015 - 11:12am. Submitted by FixIt on Tue, 02/10/2015 - 8:29pm. Having OCD, I was immediately drawn to the upside down hubcaps on the front vehicle. It only takes a few seconds to pop them off and correct the error. Submitted by rhhardin on Tue, 02/10/2015 - 7:45pm. The rudder and elevators (but not the trim tabs) are fabric, to reduce the weight aft of the hinge and prevent flutter. What looks slightly like rivets is rib stitching covered by fabric tape and dope, the stitching tying the fabric to the ribs underneath. Submitted by JerryM on Tue, 02/10/2015 - 6:01pm. I was curious about that hatch that's flipped open on top. Apparently the navigator takes celestial sightings from up there. When they called these "clipper ships" they weren't kidding. Submitted by MaltedFalcon on Tue, 02/10/2015 - 5:05pm. The little cove between Yerba Buena and Treasure Islands is still called Clipper Cove. Submitted by SouthBendModel34 on Tue, 02/10/2015 - 3:35pm. This is an interesting composition. The centricity on the three GMC trucks is balanced by the huge Boeing and the Caterpillar tractor. The Boeing would perhaps be more properly displayed in the water or in the air, her elements, but then how would the photographer have included the GMC trucks? Any of the three parts of the composition would be highly collectable today. There's something here for both old light truck and old tractor collectors, and certainly a historic flying boat like that would be the centerpiece of any aircraft museum. Alas, no 314's survive. One interesting detail is the Boeing trademark, nicknamed "The Boeing Bug", painted on the starboard vertical stabilizer. Submitted by Downer on Tue, 02/10/2015 - 3:23pm.